It’s not really Sunday without a dish of egg pasta. So, why not trying the new Laganelle with Black Truffle, Saffron DOP and Lemon? The name derives from laganaturo, a kind of rolling pin used to make a thinner and narrower pasta than Tagliatelle. This line of egg pasta made with top quality durum wheat semolina and fresh eggs include the addition of top quality ingredients to the dough that remind of the tastes and smells of the Italian culinary tradition. Let yourself be seduced by the intense perfume of black Truffle, the spicy one of Saffron and the sourness of Lemon, which, together with the taste of eggs, will give your palate an unforgettable experience. The intense perfume of black Truffle together with the taste of eggs and durum wheat semolina will give you an unforgettable experience. 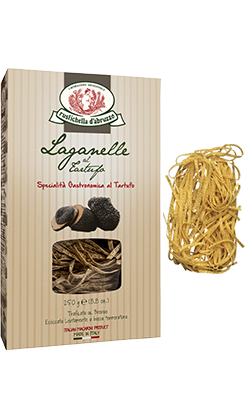 Try Rustichella d’Abruzzo Laganelle al Tartufo in the classic recipe with Porcini mushrooms, nuts and Alba black truffle slivers. We recommend it also with our ‘Tartufata’ sauce or our ‘ai Funghi Porcini’ sauce, with a bit of Rustichella d'Abruzzo PrimoGrano INTOSSO monocultivar Extra Virgin Olive Oil. Cooking time: 4 minutes. 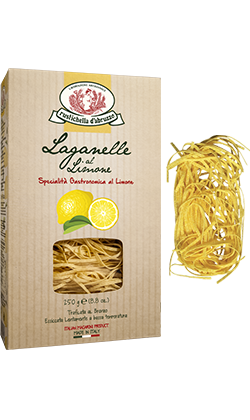 Rustichella d’Abruzzo Laganelle al Limone is made with top quality durum wheat semolina, fresh eggs and lemon juice, bronze drawn and dried at low temperature, in order to give the dough sheet an incomparable texture. The perfume of lemon combined with the one of the eggs will definitely conquer you. We recommend it with a seafood-based condiment, mullet’s eggs and a bit of Rustichella PrimoGrano INTOSSO monocultivar Extra Virgin Olive Oil. You can also season it with our ‘Vongole alla Marinara’ sauce. Cooking time: 4 minutes. 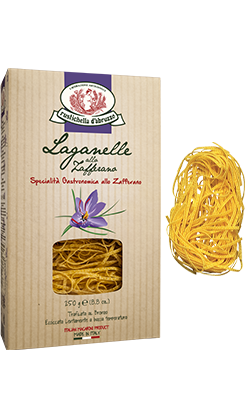 Rustichella d’Abruzzo Laganelle allo Zafferano is made with top quality durum wheat semolina, fresh eggs and L’Aquila Saffron. Try it with crispy cheek lard, leek fondue, Abruzzo Pecorino cheese and a bit of saffron, for the lovers of this refined spice. We recommend it also with our ‘alla Salsiccia’ sauce with stir-fried radicchio and a bit of Rustichella d’Abruzzo PrimoGrano INTOSSO Extra Virgin Olive Oil. Cooking time: Cooing time: 4 minutes.